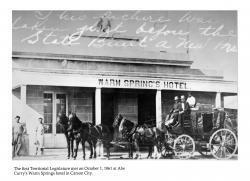 This is the Warm Springs Hotel, built by Abe Curry at the present site of the Nevada State Prison. He built it to take advantage of the natural hot springs that bubbled up from the ground there. He rented the building out to the Territorial government to use as meeting chambers for the Legislature, then later sold the property outright to the State of Nevada. Curry's wooden eagle sculpture sits on the roof of the hotel. 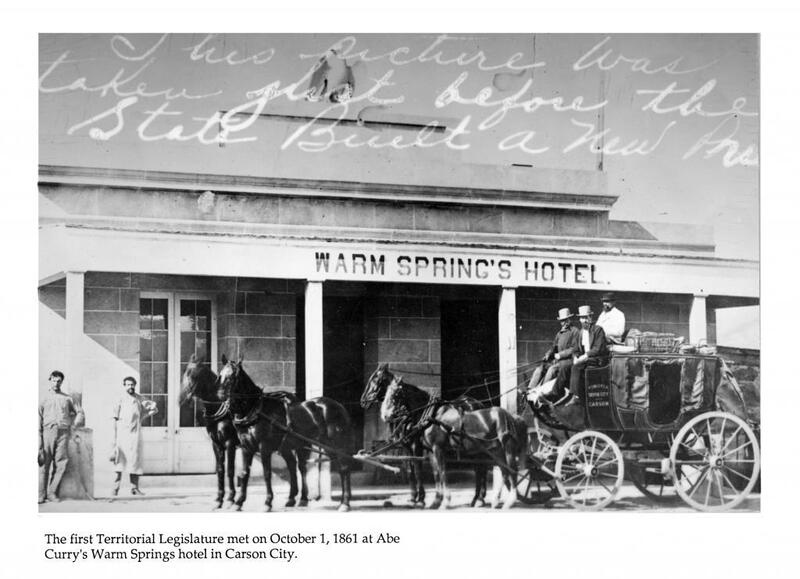 The caption reads: The first Territorial Legislature met on October 1, 1861 at Abe Curry's Warm Springs hotel in Carson City. The handwriting reads: This picture was taken just before the State built a new prison.